Chile’s geography is much stronger than its built environment. The Andes mountains for example are much more relevant in defining Santiago’s identity than any building or its urban skyline. But geography is not only a visual element; one of Santiago’s nicest features is its climate: mild winters, dry summers, crisp mornings and nights throughout the whole year. If anybody pays attention to the paintings and engravings that describe the origin and foundation of the city, one realizes that our most valuable asset is our geography both as a figure and as background. On the other hand, Chile is also known for, despite a sustained economic growth in the last decades, having one of the most embarrassing inequalities in the region, which is creating a very tense “social climate”. Those inequalities are brutally expressed in the city, with first world standard neighborhoods segregated from third world standard areas. So the question is, can Santiago’s most relevant features, geography and weather, contribute to correct our social inequalities? How? Almost the only thing that one hears as a way to correct inequalities is income redistribution. In order to redistribute income, education plays a key role; the assumption is that if you have access to a better education, you may have access to better jobs. i.e. better income. And a better salary may pay for a better quality of life. Such a process takes time because before having a better-educated generation of students, one has to have a better-educated generation of teachers. In any case it has to be stated that even if we are patient, the problem of inequalities is not only economical but mainly cultural. So the real challenge is not about leveling but about integrating. In that sense, the city may be a shortcut towards equality. Strategically identified urban projects may improve quality of life without even touching monthly income. With a salary that remains exactly the same, living exactly in the same place where a housing solution was obtained, a family can improve their quality of life if high standard projects of public transportation, urban infrastructure and public spaces are implemented. Public space is particularly effective and efficient to generate a redistributive effect. The most successful public spaces tend sit on top of geographical elements: promenades along sea sides, walkways along rivers, belvederes on top of hills, naturally capitalize the geography’s potential of creating quality urban places. So public spaces of geographical scale may be considered fresh resources and powerful tools to correct inequalities. Unfortunately, Santiago does not have public spaces of a scale and a standard that make a good use of its geography as a resource to correct inequalities. There is no single public space of a dimension in accordance with the metropolitan scale it has reached. There is not a single public space large enough to be able to take a nice walk; after a few minutes walking, one begins to wonder where to continue; our public spaces are like those intermittent rivers of the desert, which disappear after a while. 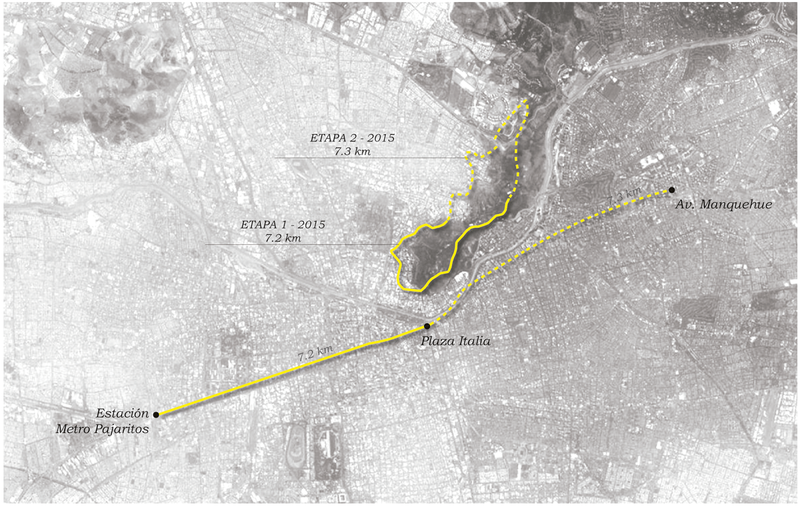 In fact, our river, the Mapocho, which could have been a natural place along which a promenade could have been built, has been occupied with highways and infrastructure leaving only intermittent public spaces along its banks. In 1999, architect Ricardo Torrejón presented as his thesis a project to transform the old Canal del Carmen into a pedestrian promenade. That old canal trace has an extension of more than 10 kilometers. Given that Santiago valley’s slope is 2 per cent and that of the irrigation canal is only 4 per thousand (i.e., practically horizontal), as the canal moves around the hill, it seems to rise above the city skyline and the entire valley. When Torrejón began to work at Elemental we assumed his idea as a common task and began to find a way to transform this kind of hill’s plinth or zócalo to become a promenade of geographic magnitude to provide Santiago, at last, with a walkway where one could forget about the road and enjoy its geography and weather. Despite its privileged position, the Metropolitan Park, is visited only by 5 million people every year (i.e. each citizen of Santiago visits the park only once a year). Although huge efforts have been made to transform the original rock into a green space, as it is a hill, it is not a place fit for taking a walk. What makes the difference may be subtle, but real: cars use the same lanes as pedestrians and those lanes are sloped. Some sports may be practiced, but one cannot go riding bikes with children, walking with the elderly people, play ball or simply walk, because there is no horizontal surface; only a horizontal place can provide that typical carefree level of a walk. 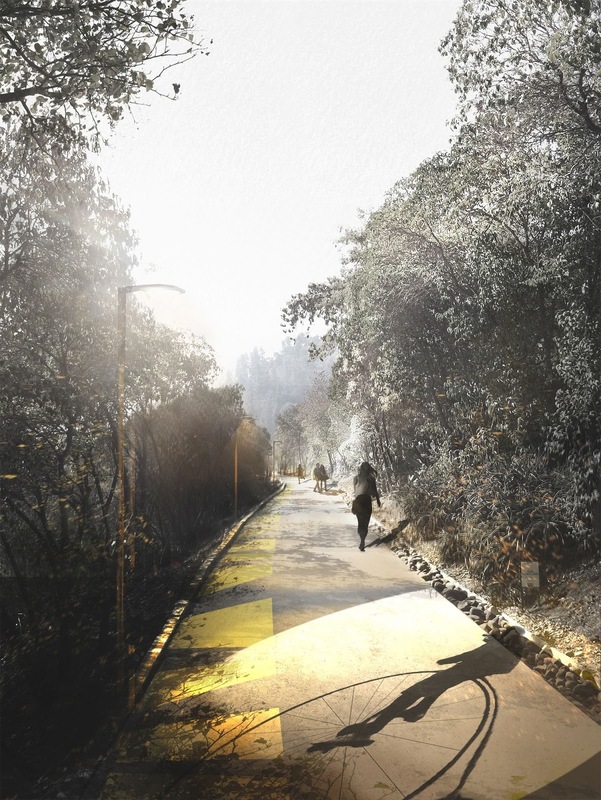 The importance of the project for a Metropolitan Promenade is that it could introduce a horizontal, pedestrian, continuous walkway that could make more accessible the hill to all citizens. Despite the simplicity of the physical operation required to transform an agricultural canal into a public space –the most difficult part of cutting the hill side was already done- 10 years went by without us being capable of convincing the different authorities of the importance of such a project. It was evident that the scarcest resource was not money but political will. It was only in 2008 during Michelle Bachelet’s first presidency of the country, that we finally saw an opportunity that could work as a foundational moment for the Promenade: the National Service of Daycare Centers, JUNJI, was looking for a place to create a Children’s Park. We met with JUNJI’s National Director, Estela Ortiz, and she agreed to design the Children’s Park on the most western side of the San Cristobal hill, the one where the most underserved neighborhoods are, using its upper limit as the first phase of the Metropolitan Promenade. The site we were given had a steep slope and we decided to transform its difficulty into its major benefit. The slope could be used to dissolve the old dilemma of children’s playgrounds: do we make them safe or do we make them fun? Being on a hillside, allowed us to accumulate height for the slides for example (fun), without ever being more than 30 centimeters away from the ground (safe). Or it enabled us to make tree houses that were right into the crown of the trees without ever climbing but only by walking horizontally into them. The upper limit of the Children’s Park coincided with the old irrigation canal, so when the Children’s Park was inaugurated in April 2012, it also meant the first phase of the entire promenade was inaugurated. In 2013 we were asked by the Metropolitan Park’s administration to transform another kilometer of the old canal on the eastern side of the hill into a walkway; but we were asked to lower the standard to a mere path and not a proper promenade. In 2014, during Bachelet’s second term, the Metropolitan Region’s Superintendence, identified the Metropolitan Promenade as one of the projects that could contribute to improve the quality of life of the people at a big scale with a relative low cost, so the political decision to complete the total extension of 14km of the whole ring was taken. During this year, 4km will be executed with the full promenade standard. Simultaneously, we will be working in developing the designs and technical specs for the other 10km so that east and west of the Park can have a direct connection and rich and poor districts can come closer to each other. This is important because it will reduce the historical debt of public space that Santiago has with its inhabitants, improving the current 4m2 per person. These numbers do not only reflect a deficit but also hide our inequalities: rich neighborhoods have 18m2 per person while poor areas have barely 1m2 per inhabitant. So the Metropolitan Promenade not only gives direct and democratic access to our main environmental asset improving people’s quality of life with a high standard public space; it also works as a new pedestrian and bicycle route that connects in a friendly and efficient way rich and poor municipalities. It is accepted that cities are weighed by what people can do in them for free. In a country as unequal as Chile, this is particularly relevant. Quality public spaces are not only a demand of a society that has already solved its basic needs, but a fundamental redistributive tool. The city, and public space in particular, is a compensation mechanism for all those that cannot have access to a better quality of life in a private way. So the city, if well designed, can become a more efficient resource than money to improve people’s quality of life. En Chile, la geografía es mucho más potente que el entorno construido. 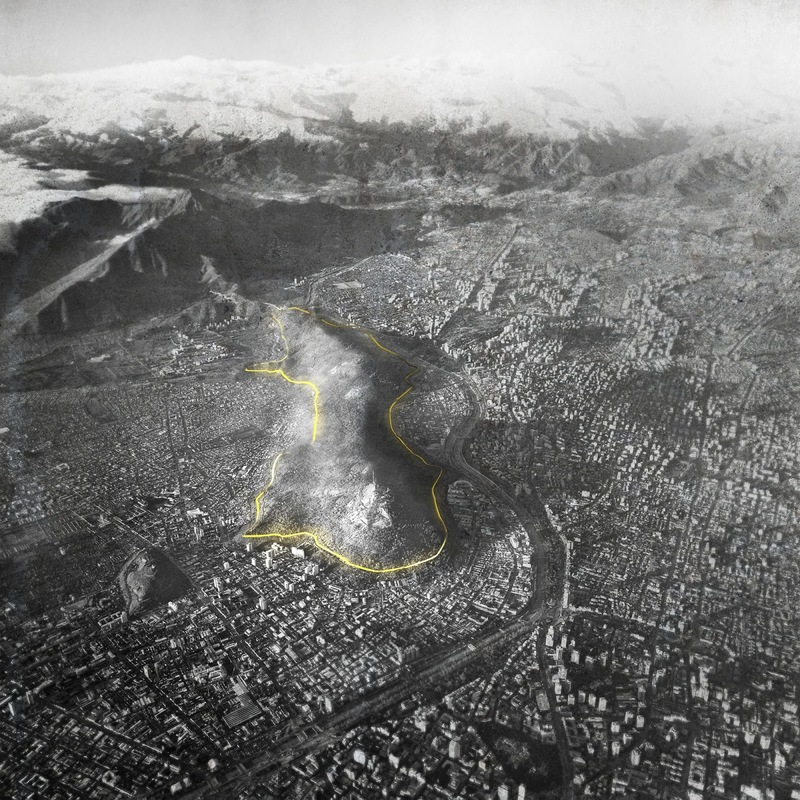 La Cordillera de Los Andes por ejemplo, es mucho más relevante a la hora de definir la identidad de Santiago que cualquier edificio o monumento. Pero la geografía no es solo una cuestión visual. Una de las mejores cosas de Santiago es su clima: inviernos benevolentes, veranos secos, amaneceres y atardeceres frescos durante todo el año. Basta mirar las pinturas y grabados que describen el origen y la fundación de la ciudad para darse cuenta que nuestro patrimonio más valioso es la geografía como figura y como fondo. 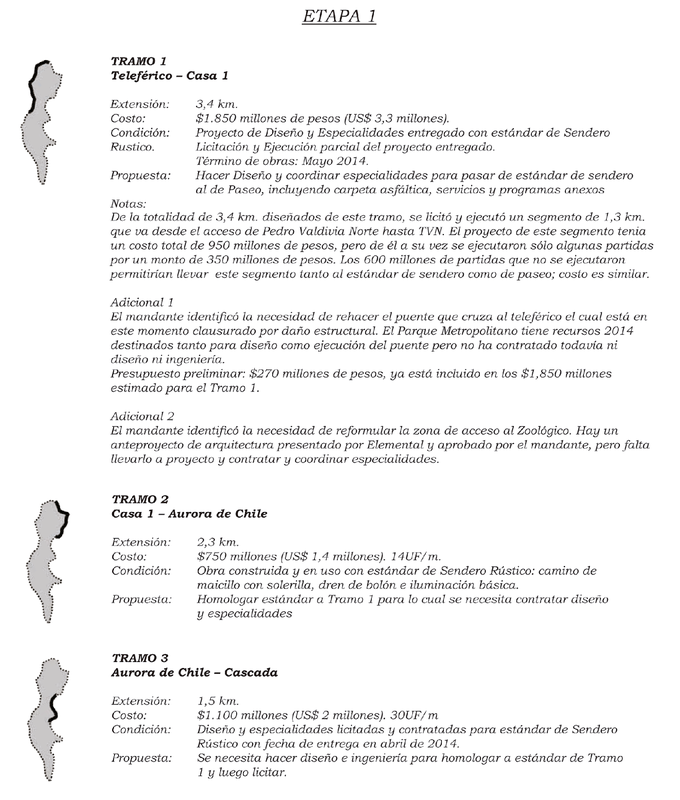 Por otro lado, Chile también es conocido por ser un país que a pesar de un crecimiento económico sostenido en las últimas décadas, tiene una de las tasas de inequidad más vergonzosas de la región, lo cual está creando un “clima” de creciente tensión social. Tales inequidades están brutalmente expresadas en la ciudad, y en Santiago quizás más que ninguna otra, con barrios que desde todo punto de vista tienen estándares de primer mundo y otros, la mayoría, con estándares muy, pero muy inferiores, segregados los unos de los otros. La pregunta entonces es: ¿Puede Santiago usar sus elementos más distintivos, su geografía y su clima, como herramientas de integración? Para corregir inequidades, casi lo único que se escucha en el debate público es la redistribución del ingreso. Para redistribuir, la educación juega un rol clave: el supuesto detrás de esto es que una mejor educación permite un acceso a mejores trabajos y un mejor empleo implica un mejor salario y por lo tanto la posibilidad de pagar por una mejor calidad de vida. Una cosa así toma tiempo, porque antes de tener una generación mejor educada, hay que tener una generación de profesores mejor educada. En cualquier caso hay que tener claro que aunque fuéramos pacientes, el problema de la inequidad no es en estricto rigor un problema sólo económico, sino sobre todo cultural. A lo que habría que aspirar, más que a la igualdad es a la integración. La ciudad en ese sentido puede ser vista como un atajo hacia la equidad. Proyectos urbanos estratégicamente identificados pueden mejorar la calidad de vida sin siquiera tocar el ingreso mensual. Con un salario exactamente igual, viviendo exactamente en el mismo lugar donde se obtuvo una vivienda, una familia puede ver incrementada su calidad de vida si proyectos de transporte colectivo, de infraestructura urbana y de espacio público de alto estándar son implementados en la ciudad. El espacio público es particularmente eficiente para generar un efecto redistributivo. Los espacios públicos más exitosos, son aquellos construidos sobre los elementos geográficos de las ciudades: costaneras a lo largo de la costa, paseos a los largo de ríos, miradores sobre los cerros, por nombrar sólo algunos, naturalmente capitalizan el potencial de la geografía para sustentar lugares urbanos de calidad. Espacios públicos de escala geográfica pueden en ese sentido ser considerados recursos frescos y herramientas poderosas para corregir inequidades. Desafortunadamente Santiago no tiene espacios públicos de la escala y el estándar que permitan hacer uso de la geografía como atajo hacia la equidad. No hay un sólo espacio público en Santiago que tenga una dimensión acorde con la escala metropolitana que ha alcanzado. No hay un sólo espacio público suficientemente extenso para poder dar un buen paseo; luego de apenas un par de minutos uno debe cruzar calles o empezar a preguntarse por dónde seguir. El río Mapocho, el lugar natural donde se podría haber constituido un paseo de esta naturaleza, fue ocupado por autopistas y carreteras, dejando veredas y áreas verdes intermitentes. 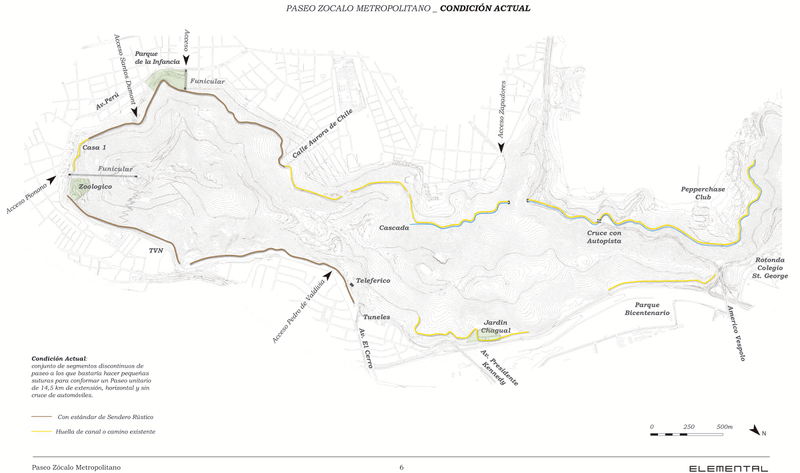 Sólo nos queda una última oportunidad: El Parque Metropolitano de Santiago en el cerro San Cristóbal. Se trata de un brazo que se desprende de la cordillera de los Andes avanzando sobre el valle de Santiago; su dirección y forma desvía diagonalmente el curso del río Mapocho funcionando como una especie de represa geológica que acumula el material sacado de la cordillera por el río al punto que hay una diferencia de casi 100 metros de altura si se compara el pie de cerro oriente con el pie de cerro poniente del Parque Metropolitano. 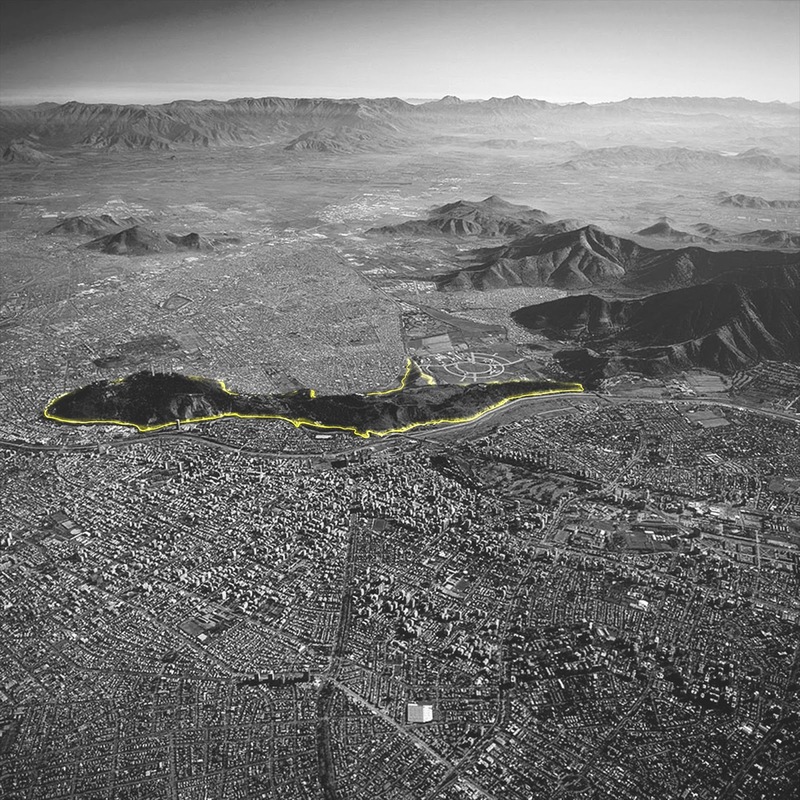 Esta barrera geográfica natural significó que históricamente la parte norte de la ciudad no tuvo agua que permitiera explotarla agrícolamente. Por esta razón durante la colonia se construyó una canal de irrigación que rodeaba la base del cerro, el Canal El Carmen, para llevar agua a las tierras del norte. Más tarde, en la década del 60, ese canal de regadío se entubó para atravesar directamente el cerro y la huella seca de ese canal quedó disponible en el pie de monte. 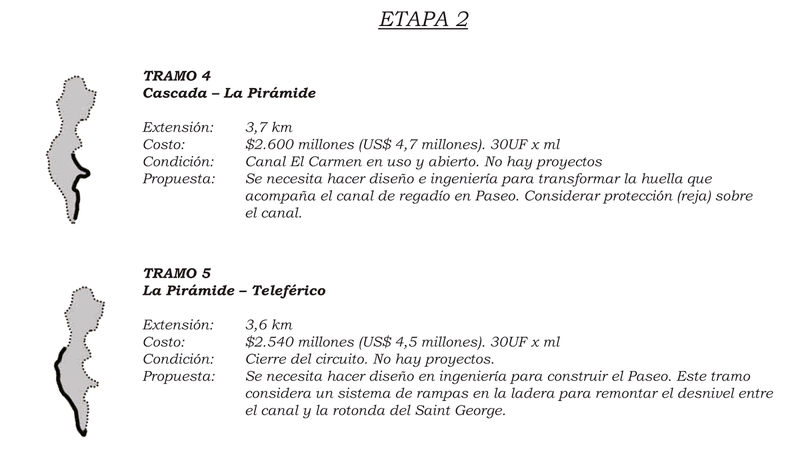 En 1999, el arquitecto Ricardo Torrejón presentó como Tesis de Titulo un proyecto para transformar la huella del antiguo Canal El Carmen, el cual tenía una extensión de más de 10 km en un paseo peatonal. Dado que el valle de Santiago tiene una pendiente constante de 2 por ciento en sentido oriente poniente y este canal de regadío tenía una pendiente de 4 por mil –es decir prácticamente horizontal- a medida que se avanza por la huella hacia el poniente, se tiene la impresión de elevarse por sobre el valle y por sobre la perfil de la ciudad. 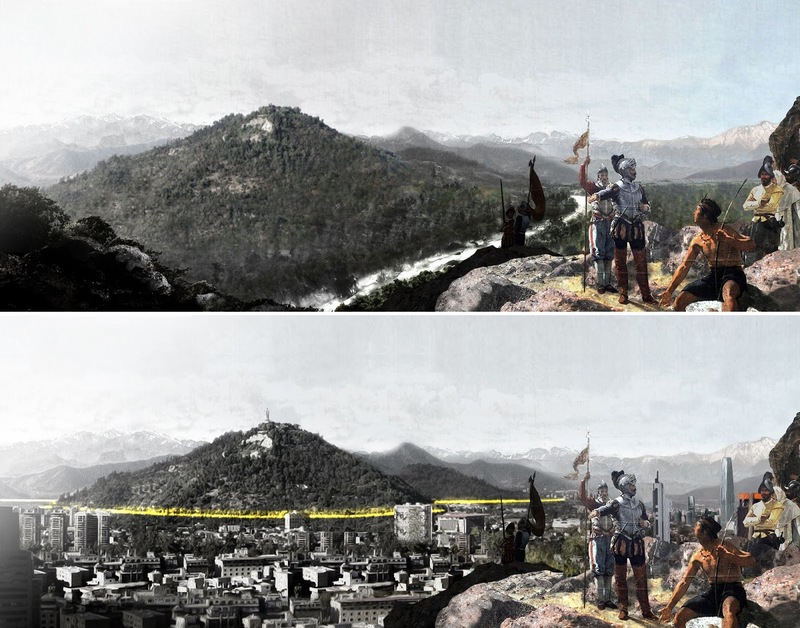 Cuando Torrejón comenzó a trabajar en Elemental, tomamos como propio su proyecto y comenzamos a trabajar para transformar esta especie de Zócalo del cerro en un Paseo de escala geográfica que pudiera pagar la deuda histórica de Santiago de espacio público de Santiago y poder contar por fin con un lugar donde poder disfrutar de su geografía y su clima. A pesar de su posición privilegiada en el valle y en la ciudad, el Parque Metropolitano es visitado apenas por 5 millones de personas al año; cada ciudadano visita apenas 1 vez al año el Parque. A pesar de los esfuerzos notables que se han hecho para transformar lo que era originalmente sólo una enorme masa rocosa en un área verde, el hecho que sea un cerro hace que sea un lugar en el que es difícil pasear. Lo que hace la diferencia puede ser sutil pero muy real: las vías del Parque Metropolitano están en pendiente y deben ser compartidas entre peatones , ciclistas y automóviles. Se practican algunos deportes en sus caminos, pero no es posible ir a pasear o andar en bicicleta con niños, caminar con adultos mayores o simplemente jugar a la pelota porque no hay superficies horizontales; sólo un plano horizontal separado del auto permite el nivel de despreocupación necesario y típico del paseo. 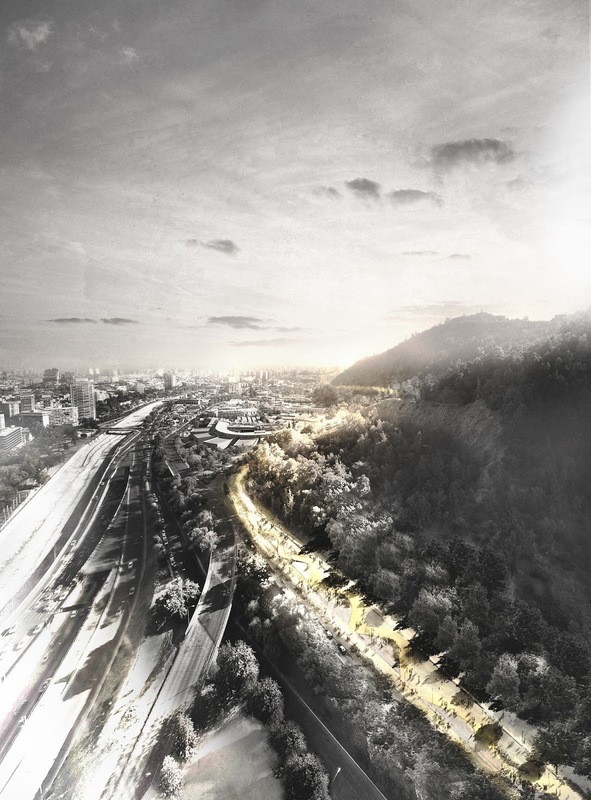 La importancia de contar con un Paseo Metropolitano es que introduce una vía horizontal, peatonal continua de escala geográfica que hace más democrático el acceso al cerro y a un espacio público de alto estándar. A pesar de lo sencillo de la operación para transformar un antiguo canal de regadío en un espacio público de escala geográfica–la parte más difícil, esto es, hacer un corte en la ladera ya estaba hecha- pasaron 10 años sin que fuéramos capaces de convencer a las distintas autoridades de la importancia de este proyecto. Era evidente que el recurso más escaso no era el dinero sino la voluntad política. Finalmente en el 2008, durante la primera presidencia de Michelle Bachelet , llegó por fin la oportunidad de colocar la primera piedra del Paseo Metropolitano: la Junta Nacional de Jardines Infantiles, JUNJI, estaba buscando un lugar para crear un parque para niños. Su directora nacional, Estela Ortiz, estuvo de acuerdo en diseñar el Parque de la Infancia, en la ladera poniente del cerro, en uno de los barrios más deficitarios en términos de áreas verde por habitante y de usar el limite superior del Parque como la piedra fundacional del Paseo Metropolitano. El terreno tenía una fuerte pendiente y decidimos usar esa dificultad en su mayor valor. La pendiente podía ser usada para resolver el dilema clásico de un parque de juegos: ¿hacerlo seguro o hacerlo entretenido? Al estar sobre una ladera podíamos acumular altura para los resbalines (entretenido) sin tener que estar nunca a más de 30cm del suelo (seguro). O podíamos construir casas en los árboles que llegando a su copa sin nunca tener que escalar sino simplemente caminando horizontalmente. Al coincidir el límite superior del Parque de la Infancia con el antiguo canal de regadío, el día de la inauguración del Parque en abril de 2012 se podría decir que fue el día en que se puso la primera piedra del Paseo Metropolitano. 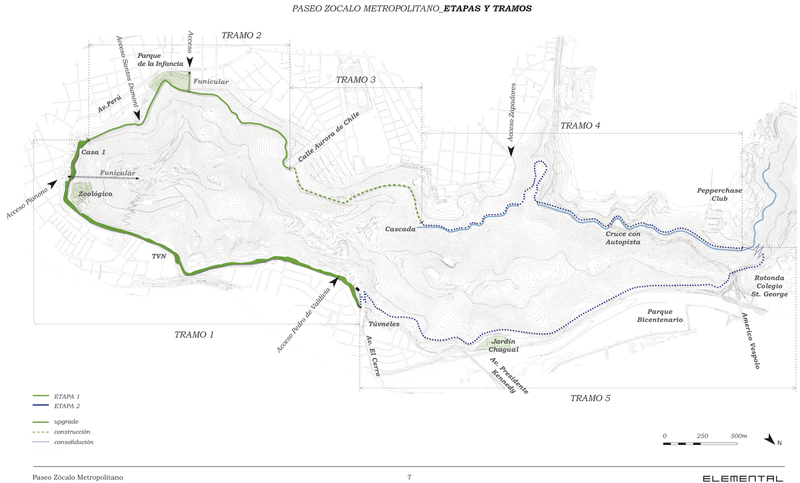 En 2013 la administración del Parque nos pidió implementar un tramo del Paseo en la parte oriente del cerro, pero nos pidió bajar el estándar de Paseo Metropolitano al de sendero rústico. El 2014, durante la segunda administración de la Presidenta Bachelet, la Intendencia Metropolitana identificó al Paseo como uno de los proyectos que podía contribuir a mejorar la calidad de la vida de la ciudadanía a gran escala y a un costo relativamente bajo. Ellos asumieron el compromiso político de completar la totalidad de los 14km de extensión del Paseo Metropolitano. Durante este primer año se ejecutarán 4km con el estándar de paseo. Simultáneamente se comenzará con el desarrollo e ingeniería de detalle que permita licitar los restantes 10 km y poder así conectar de manera directa comunas ricas y pobres. Esto es relevante porque al dar acceso a espacios públicos de calidad se estaría reduciendo la deuda histórica de Santiago en esta materia pero sobre todo se estaría corrigiendo la tiranía de los promedios: Santiago tiene en principio, 4m2 de área verde por habitante : lo que no se dice es que en realidad, las comunas ricas tienen más de 18m2 de área verde por habitante mientras las comunas pobres menos de 1m2 por habitante. Un Paseo Metropolitano por tanto, no sólo permite un acceso directo y democrático a nuestro mayor bien medioambiental incrementando la calidad de vida por medio de un espacio publico de alto estándar; también introduce una vía peatonal y de bicicletas que conecta de manera amigable y directa comunas ricas con comunas populares. Las ciudades se miden por lo que en ellas se puede hace gratis. En un país tan desigual como Chile, esto es particularmente importante. Espacios públicos de calidad no son sólo una demanda propia de una sociedad que ha resuelto sus necesidades básicas, sino además una herramienta redistributiva fundamental. La ciudad, y el espacio público especialmente, son un mecanismo de compensación para todos aquellos que no pueden acceder a una mejor calidad de vida de manera privada. Por lo tanto la ciudad, en la medida que esté bien diseñada puede funcionar como un atajo hacia la equidad, como una fuente de recursos mas eficiente que el dinero para mejorar la calidad de vida de la gente.